This entry was posted on Wednesday, January 23rd, 2019 at 8:50 PM	and is filed under Medieval, Museums, Renaissance. You can follow any responses to this entry through the RSS 2.0 feed. You can skip to the end and leave a response. Pinging is currently not allowed. In 1520, Albrecht Dürer went on a business trip to Antwerp and a few other Flemish cities. Apparently, he took all kinds of cases, prints, books -and a whole lot more- with him, had a network of commercial transportation and was exchanging the stuff like mad (and he took notes). Marcelli: A Venetian coin worth 10 soldi. Stiver: A Netherlandish coin worth about 80 pfennigs. Philip’s: A Netherlandish coin worth rather less than a Rhenish florin. Crown: A Netherlandish coin worth 6.35 marks. Noble: The Rosennobel = 8 marks, 20 pfennigs (Fl. one = 9 m, 90 pf). Blanke: A silver coin = 2 stivers. Angel: An English coin = 2 florins, 2 stivers Netherlandish. 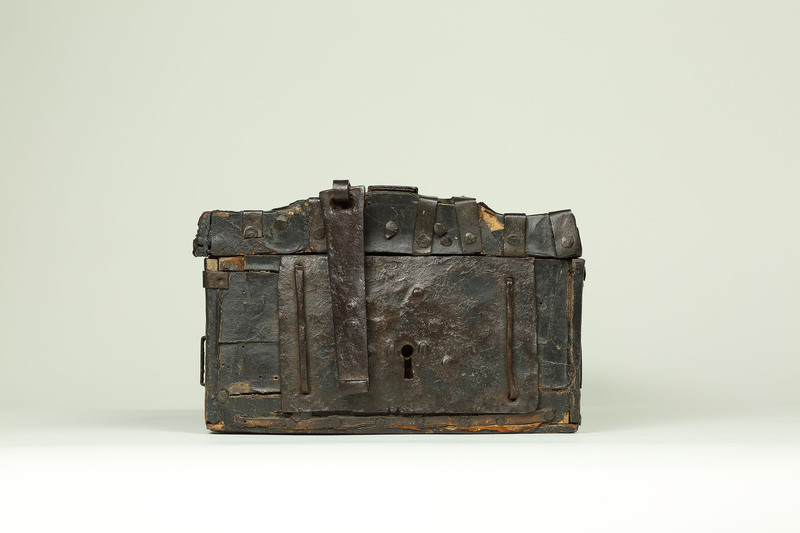 Thank you for the very interesting story about the book casket. It was special to me, as I am a total book geek (a retired library cataloger). The “Flight into Egypt” image came at a perfect time. Obviously the artist had no idea of what the Holy Land looked like or the clothes people would have worn in the biblical middle east. The landscape is pure late 15th century France. What makes this a treasure for me is that the man we may assume is the long-suffering Joseph is wearing a “Gaston Phoebus” tunic ( see “historical inspirations” at https://revivalclothing.com/product/linen-tunic/#1532128395170-3f737b1f-9d6f ). While the tunics of this type are typical of the 14th century, here we see it still being worn in 1491, and with a hood! This tunic seems to have been as universal as modern blue jeans, and was common in both France and England. If the English wore it, so did Lowland Scots. This is almost exactly what I wear in the SCA as a 1496 Lowland Scot. I will soon be teaching a class on Scottish clothing, and the confirmation that the Gaston Phoebus tunic was still in use in the 1490s couldn’t have come at a better time. 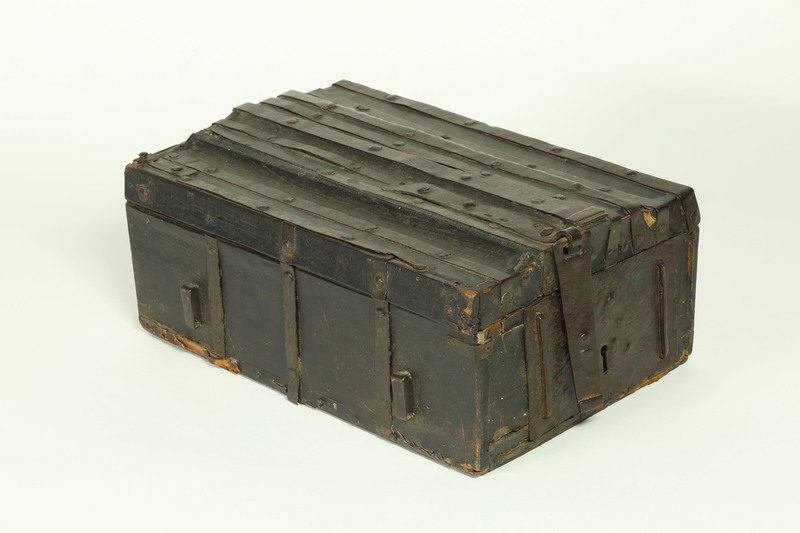 Is this box made of wood covered in leather? Is difficult to tell as there seems to be a ton of varnish on top. Frankly, I wondered where I had seen the winged bull and the lion before, and as I had found out, wondered where the eagle and the angel had gone. When looking closely, it’s all there, and I now understand the idea of what kind of books were transported in that ..er.. ‘Gothic’ coffer. The Evangelist’s symbols are: the Lion of Mark, the Eagle of John, the Ox or Calf of Luke and the Angel or Man of Matthew. Often all symbols are shown with wings, as in the coat of arms of Venice, whose patron saint was Mark. They are a common feature in larger Gospel Books from the the 6th century until the decline of that format in the High Middle Ages, by which time they were being used for portraits of other authors. OK, as in the 15th century the ‘Middle Ages’ were about to be left behind, maybe other types of literature were about to be carried around, but the woodcut print does not really support that, or does it? 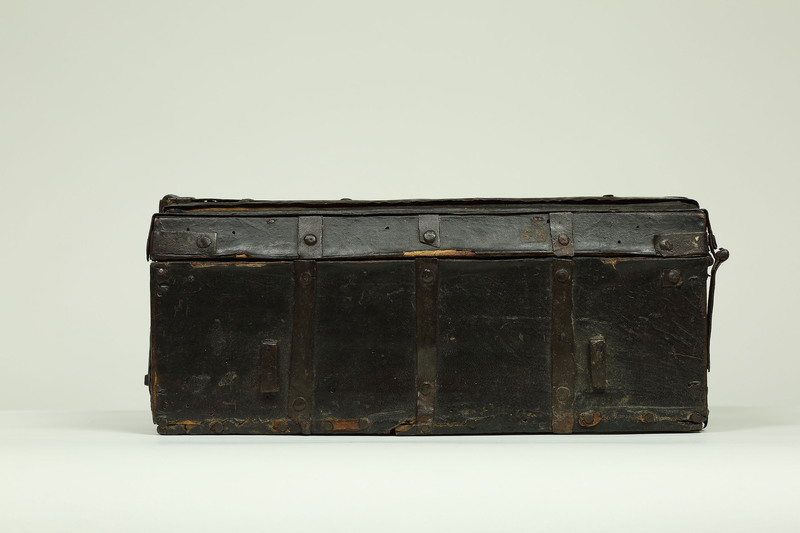 (Dürer, for example, did not only transport books in cases, he also wrote some). Fascinating article and as usual, the comments are as interesting as the article. I love the details in the painting, especially the leaves and vines climbing everything. Did you notice the nest at the top of the tree? At least, I think that is what it must be. If only Mary and Joseph could have been this comfortable in their travels. 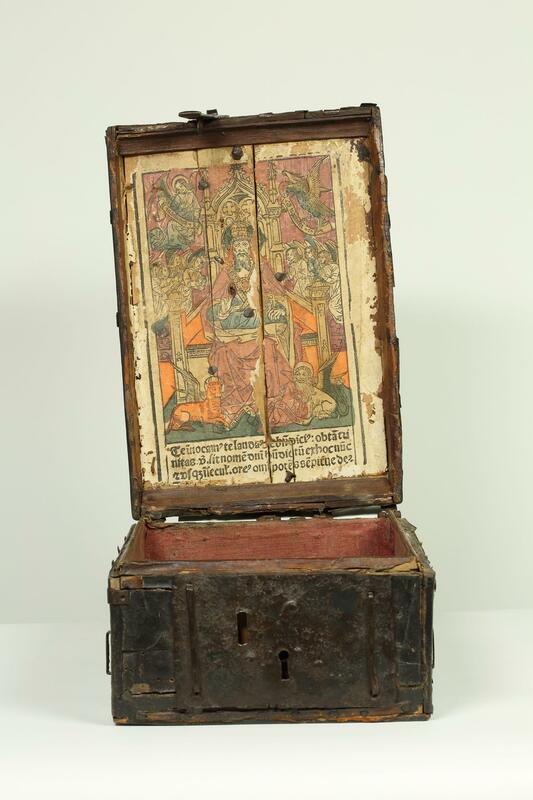 I see that in the painting the book chest has a leather or cloth flap that would conceal the lock. 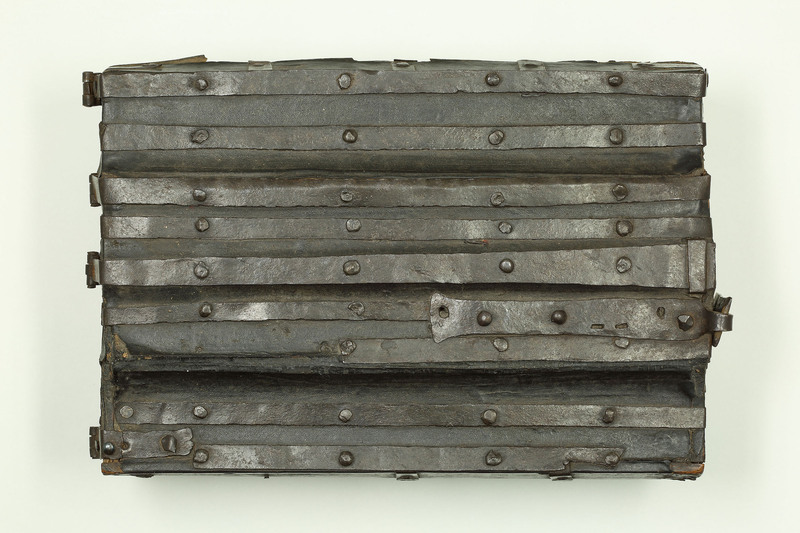 I can also see a strip along the lower edge of the lock side of the chest – would this be the remains of a similar flap? On the top of the chest there is a strip of metal with a hole in it that might have been a catch to hold the flap in place. 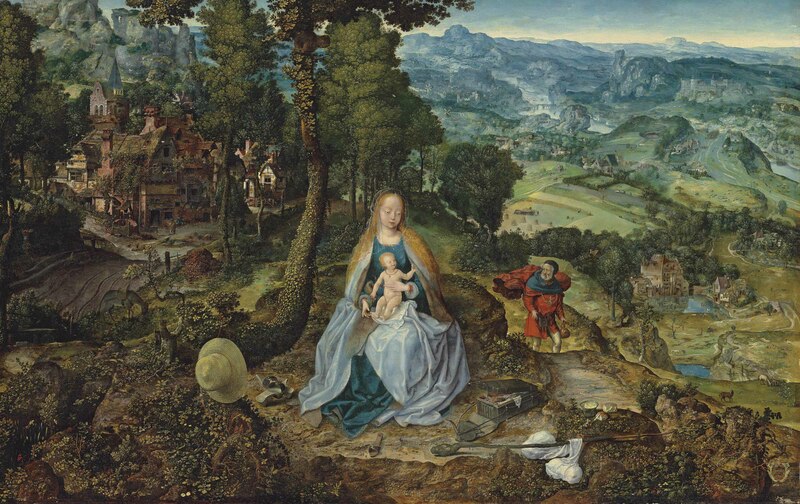 The painting, “Rest on the Flight into Egypt” was painted in 1530, before the King James translation. Some of the symbols in the painting are most interesting. For example, the single shoe next to the staff with the facsimile of a serpent’s head is an allusion to the Hebrew scripture that Eve(Mary) will crush the serpent’s head. The pair of shoes on the left side indicates that this is holy ground, Exodus 3:5. Mary wears a delicate veil to indicate her virtue. Her hair is not braided to signify she is a virgin. Mary’s hat is made of plaited straw and sewn row by row, exactly as it is still done 500 years later! tres chic! Is there any research for symbolism in religious art that has been published? Thank you again for posting! Yes, I also noticed the additional single shoe in the painting, am -now that you mention it- a bit worried about the book coffer being blatantly misused as some form of lunchbox, and there also is a coat of arms in the bottom right hand corner that should be easily identifiable. Where exactly did it say 1530? Did it say a bit more? Back then, Belgium was part of the Low Countries or Netherlands. Of course, the coat of arms might be from elsewhere. The next to the last paragraph states the painting was made in 1530. The above link is to an interesting article about the symbolism of the shoe in ancient Israel. Ah, so the stick is like a serpent, heading for the shoe that will crush it. So what is the meaning of the cloth laid over the stick and apparently concealing fruit / a spare set of breasts?